Brad Slaugh is a bit of a jokester. You see it in the postcards for the semi-annual open studios event he runs at Poor Yorick Studios (which he has operated for 15+ years): the card inserts the skeleton of Denmark’s famous court jester into an iconic work of art; or there was the time he got in trouble on Facebook for calling out 15 Bytes editor Shawn Rossiter — “weak on Formalism and Neo-Constructivism! Sad!,” he tweeted posted (in turn, Rossiter, who has a studio at Poor Yorick, tried to get Slaugh impeached; his rent went up). Then there’s this photo: in 2013, Slaugh was selected by 200 of his peers as one of “Utah’s 15 most influential artists.” His response? When Zoe and Robert Rodriguez came to the studio for a photo shoot, this is the one Slaugh wanted to go with. This image appears in 500 copies of a nicely bound publication sitting on coffee tables throughout Utah.You can catch Slaugh and 45 other Utah artists this Saturday at the Spring Open Studios event, March 24, 4-10 pm. 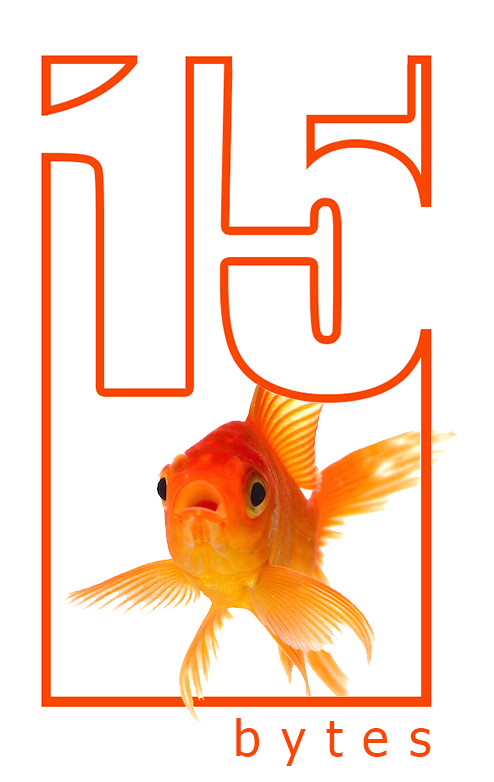 The following profile by Van Lewis appeared in Utah’s 15: The State’s Most Influential Artists, published by Artists of Utah in 2014. In Brad Slaugh’s paintings, people tend to see two extremes of artistic approach: on the one hand, his paintings touch on what have to be recognized as grand old art tropes and forms. He has quoted, in large, Academic scale, Hugo van der Goes’ “Portinari Altarpiece,” but with figures from his family photo album. At truly monumental scale, he has referenced DaVinci’s “Last Supper” (in “Feast,” displayed at the Fall 2013 Poor Yorick Open Studio), replacing Jesus and the Apostles with, again, members of his Utah family, eating hotdogs and Jell-O salad in what appears to be a faux- wood-veneered family room. And smaller, often cheeky, borrowings abound: a devil from Fuseli’s “Nightmare” leers from atop a Helper, Utah, gas-pump; some latter-day martyrs, borrowed from El Greco and Catholic iconography, take a Sunday drive; a Delacroix figure drives a Volkswagen “Thing”; and El Greco’s St. Francis of Assisi, renamed Larry, manages a junkyard. Elsewhere, figures from Caravaggio, Courbet, and others appear. Generally, the effect is a kind of art-historical inside joke: viewers who remember their Courbet will chuckle a little longer over “Family Plot,” with its embedded quotation of “A Burial at Ornans,” and may even recognize figures from El Greco. This specialized knowledge is not necessary to enjoying—and getting— the paintings, but it adds a layer of meaning, more or less intertextual. On the other hand, Slaugh’s paintings are assemblages of gorgeously-rendered and often poignant details. Slaugh is, first and last, a painter, and you can see this in the obvious pleasure he takes in putting paint (and pastels and charcoal, etc.) on a surface. There seems to be a recent divide between painters who reference art history and theory and those who can really paint, with technical and expressive proficiency. Some artists address their paintings entirely to art historians: there is little sensual pleasure in the painting per se, but art-historical references abound, and ironic riffs on theory and criticism overwhelm illustrative narrative. These paintings belong entirely to an urban cognoscenti. Slaugh’s works, emphatically, do not. In his big, supposedly art-historical paintings mentioned above, these details tend to float in a field of other details, each one somehow grounding the allegories and lofty quotations in earthy particularity and strange poignancy. In “Feast,” for example, in place of DaVinci’s purely symbolic bread and wine, Slaugh draws the table covered in familiar and profane food products of our moment: bottles of French’s mustard, Cheetos on a paper plate, bags of Wonder Bread hot dog buns, etc. Over and over again, viewers gravitate to a sumptuously-drawn can opener. The attention Slaugh has lavished on this mundane object seems to reduce the entire vast drawing (33’ x 9’!) to a simple insight: that if you pay enough attention to something, even if it’s terribly mundane, it takes on a luminous significance that refuses all the usual dismissals. Nothing, in this way of seeing, is merely ugly or functional or necessary. Everything shines. But that’s not all. These objects keep transcending still-life. They are not just voluptuous and skillful, though that would be enough. Something else happens. These objects tend to feel significant, and that significance tends to inform the entire painting. This is where Slaugh’s best paintings achieve moments of uncanny strangeness. At least for this viewer, these paintings can feel almost religious. Not churchy, by any means. Rather, there are moments when these details feel like little conduits to understanding. That can opener, in all its banal familiarity, glows a bit like a medieval chalice. Slaugh studied painting and drawing at the University of Utah under Paul Davis and Tony Smith, among others. He then completed his MFA at Boston University, where he won the Khan Award for painting. At the final MFA group exhibit, his “Portinari Potluck” was the obvious center of gravity: people couldn’t take their eyes off it (it is now on permanent display at the Salt Lake County building). During the months it took to complete, Slaugh took considerable flack from his peers and professors as the strange vision came into focus. Where Hugo van der Goes painted an imagined, stylized Bethlehem, Slaugh renders what appears to be a southern Utah public park, with its picnic ramada, swing set, and playground. The Altarpiece is populated with angels, saints, and the baby Jesus, each painted according to the conservative Medieval types and conventions of composition. In Slaugh’s scene, the analog angels take flight not on wings but on swings; the Magi and attendants are replaced by family members with period-perfect clothes; in place of Mary, there is Slaugh’s ex-wife, kneeling, but maybe less in reverence than in an attitude of loving diaper-changing; and his newborn daughter Grete takes the place of Jesus, all fingerpainted, meaty baby-perfection. And those luminous details reward any amount of scrutiny: in the foreground, where Hugo paints the symbolic flowers, Slaugh places a meticulously rendered houseplant, emphatically not symbolic, unless it stands for rootbound domesticity. In place of Hugo’s obligatory architectural background, Slaugh includes a cherry rendering of a Jeep Cherokee. Both include grazing sheep. The compositions are superficially similar, revolving as they do around the beloved newborn, but Slaugh doesn’t duplicate anything from the Altarpiece. He pays homage. His love for the Altarpiece is obvious. But, again, there’s the uncanny. Viewers can smile at the mundane details and character studies, much as they would watching a Wes Anderson film. But there is so much feeling of significance. Parental love suffuses everything, and the complicated, eye-rolling affection we feel for our families throbs like a bass note under the caprice of period specific stage-set. After graduate school, Slaugh returned to Utah, to the people and places he knows. 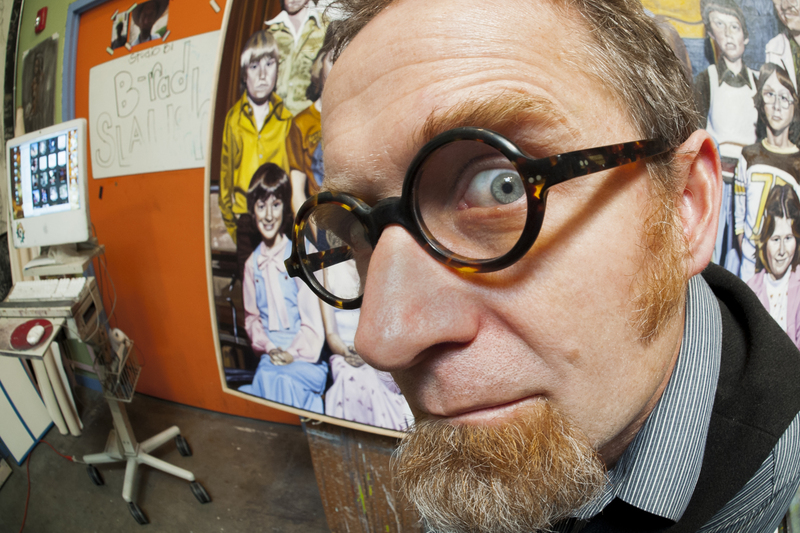 Though he jokes that he’s working hard to “move the culture sideways,” in fact, during the past 18 years, he has taught drawing and painting to hundreds of college students at the U of U and, currently, at Salt Lake Community College, where his focus is on technical proficiency in drawing and painting. His students spend long hours matching colors and learning to see what’s actually in front of them. He has also been landlord to many Utah artists. In 1997, Slaugh converted a warehouse into Poor Yorick Studios, where artists rent affordable workspace. Poor Yorick has grown and moved to its current location in South Salt Lake where the 50 resident artists host semiannual open studio events for crowds of over a thousand. He can be found there most days patching drywall, winterizing evaporative coolers, feeding feral cats, dealing with roofers and plumbers and otherwise keeping Poor Yorick going. One wishes he’d spend more time painting and showing, but his influence on Salt Lake’s art community is everywhere, not least in teaching and running the studios. Membership in the community of artists is a constant, if unspoken, theme in Slaugh’s approach to painting. He does not pursue originality or uniqueness for its own sake. He is quite frank about his influences, and openly adoring of those artists whose work has spurred his own. Most obvious of Slaugh’s influences is probably Alice Neal: her figure painting eschews objective accuracy in favor of loose, quick drawing that attains accuracy in the depiction of character. Each person’s expression shows in what the artist saw and interpreted and painted, not in any strict verisimilitude. And, as with Slaugh’s best figures, Neal’s seem to have a personal, alive presence somehow contained in paint. Slaugh went to her gallery in New York in 1994 and immediately felt “blown away, absolutely undone” by her portraits. He cites Neal’s painting “Two Girls,” in which a pair of young girls look back at the painter, and at the viewer, as intensely as Neal must have looked at them. They are rapt, and so was Slaugh when he first saw it. He describes what could be seen as a conversion moment: “This was the most religious experience I’d had up to that moment, that time in my life.” When Neal was battling—or ignoring—her mainstream Modernist critics in Manhattan in the ‘50s she had to contend with their frequent assertion that her figures were little more than caricature. Slaugh has faced similar criticism. And, to be fair, both painters have produced figure paintings that lack that vivacity and fail to require rapt attention, and that are mired in mere depiction of grotesquery or peculiarity. But neither painter ever shows contempt. In fact, they each show a deep regard, and even affection, for their subjects. Even when the paintings lack that uncanny something, and fail, they remain unimpeachable, because they do not disdain the subject. Other reviewers of Slaugh’s work have interpreted his rendering of figures, particularly when he paints family members, as contemptuous or critical. But it is much too easy to read his refusal to idealize as contempt. His frank honesty feels respectful and kind, as though whatever annoyance the subject’s personality and convictions may cause the painter, these can be forgiven. This, by the way, is a very risky approach to figure painting: to achieve this eye-rolling affection Slaugh has to land, repeatedly, between cold, harsh, possibly prejudiced depiction, on the one hand, and sentimental idealization on the other. To illustrate this risk and its dangers, look at Family Plot. The figures borrowed from El Greco are competent, painterly studies. The figures from Slaugh’s family photo album, however, are personalities, alive with peculiarity, both irksome and lovable. Another example: Slaugh is also influenced by Lucien Freud’s figure paintings, which he first saw on that same trip to New York. But, whereas Slaugh and Neal share an obvious warmth toward their subjects, Slaugh admired, but did not feel real kinship with, Freud. He reports feeling exhausted by the show. “There was this sense of enough, of just not needing or wanting any more. It was all these bodies right there and I just . . . it was like each one was utterly enervating. They sucked the life out of me.” Freud often painted family members, but was notorious for treating them like his other models, with an almost scientific curiosity and dispassion. His paintings of his estranged daughters are among the most discomfiting figure paintings ever made. Freud attempted perfect, clear, unprejudiced, unstinting depiction. Figures, for him, were flesh, and he achieved tremendous fleshiness. For Slaugh, conversely, figures are character. And, when he’s totally on, his characters feel alive and conversant. Slaugh cites several other painters as key influences: Edward Hopper, for his ability to make even the most static scenes contain narrative undercurrents; Richard Diebenkorn, for his economy, color, and ability to animate the inanimate; David Hockney, for knowing exactly the right moment to snap the picture; Robert Bechtle, for finding tragicomic warmth in the bland and mundane. But Slaugh’s most revealing influence is not a visual artist. 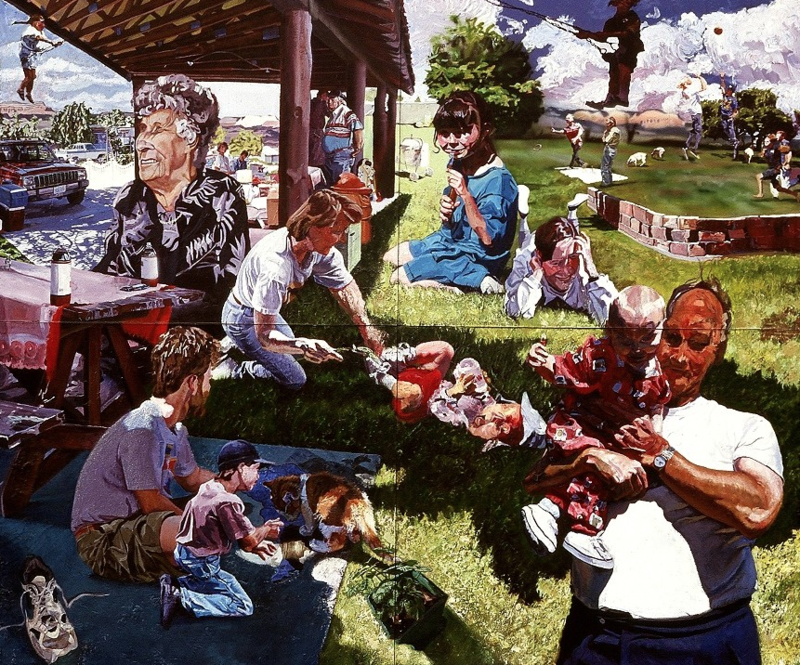 Brad Slaugh, “Portinari Potluck,” 120″ x 144,” Salt Lake County Art Collection.